With Bontempelli, Matthew Boyd and Dahlhaus on the sidelines, the Bulldogs got off to a predictable slow start. However… At the half, Twitterland was calling for Lions’ blood. Stef Martin (RUC, $538,000) was only on 13 points and that was from 17 hit outs. Yep, you do the maths there. 1 handball + 17 hit outs, take away two frees against = A disgusting 13. He bounced back with a 29pt third term (42pts at end of third) to end the day on 54. Coaches who are concerned with big Stef, have every right to be worried… unless you’re looking too much into the JLT. Tom Rockliff (MID, $704,000) was copping hate tweets left right and centre after he only registered 9 touches at the half. He ended the day on 82 (8 tackles) from just 66% game time so people need to relax a little and jump off Rocky at your own peril. He’s a pig for gods sake and if you want to look into a game like this too much, then good luck. It can’t be taken too seriously. Brisbane were experimenting with midfield combos and at one point they started Rich, Keays and Bastinac in there at the same time… please. Also with just 15 points at the half was Hugh McCluggage (FWD/MID, $246,000). He ended the nig ht with just 37 from a fair amount of time on ground. Big concern here as we hunt down a rookie in our mids. Jake Barrett (MID, $150,000) was on fire early with 67 at the half. He finished on 82 from 66% game time and his ownership of 18% will now sky rocket to where it should have been. Oh but wait… he’s still rookie listed but surely after the pressure he applied in the forward line, he’s getting promoted and starting round one. The one we wanted to watch thought was Dayne Beams (MID, $519,000) and he was bloody impressive with 87 from 64% TOG. He was everywhere and looked great for a guy who hasn’t played since round 8 last year, where he only managed two games for the season. His 24 touches were sharp and after being priced at 86, he’s good for another 15-20 on top of that. Oh and Dayne Zorko (MID, $640,000) had 160. What the? 160? Yes he did team. 160 with 34 touches and 12 tackles. He tried. Boy he tried hard and was a BEAST with a 52pt final term. Currently owned by 0.9% of coaches and rightfully so, but after this… things will change and so should some Draft orders. The thing I liked about the Lions was the fact they played a VERY Fantasy friendly game. Lots of controlled possession but not under much pressure from the Dogs I must admit. For the Dogs, with so many stars out it’s hard to get a true picture here but Jack Macrae (FWD/MID, $596,000) was great with a team high 96 and Lin Jong (FWD/MID, $458,000) was solid up forward and should be adjusted in Drafts too. He scored 75 from 17 touches. Tom Boyd (RUC/FWD, $347,000) was back to being Tom Boyd with 37 from 85% TOG. He’s back to playing dodgeball again and should be scrapped from any of your plans. But Zorko did have 160…. Yep 160. Let’s end on a good note here! Given the horrendous conditions up in Sydney – oh and the weather – it was pretty clear there wasn’t many players giving it their all. Callan Ward ($579,000) excelled in the conditions, top scoring for the game with 87 points. Jake Lloyd ($521,000) also joined him on 87 points and his DPP status has him right on my radar for early selection. Callum Mills ($441,000) was impressive again, scoring 84 points and seems like he won’t be the type of player that gets the second year blues. These teams have a lot of established players, who you know what to expect from. The likes of Heath Shaw, Josh Kennedy, Dan Hannebery, Lance Franklin, Luke Parker, Ryan Griffen, and so on, and so on. For that reason, there’s no real point reviewing their performances because they’re all established players at this point in their careers. Instead, let’s focus on the younger guys. Tim Taranto ($248,000) showed that the struggling Giants are at least going to have a few more A-grade players coming through in the next few years. The dual position rookie scored 66 points from 76 per cent game time and looked ready for senior footy already. Josh Kelly ($542,000) scored 69 points from 41 per cent game time and could be on the verge of becoming a Fantasy elite. Will Setterfield ($242,000) was only given 52 per cent game time for a score of 31. Darcy Cameron ($156,000) scored 35 points from 30 per cent game time and looked impressive while he was out there. Obviously, it’s hard to see him cracking into that Swans line-up any time soon. Oliver Florent ($230,000) was quieter this week, only managing 36 points from 62 per cent game time, but it probably won’t detract from his chances of playing round one. We all know how little Sydney care about pre-season games. Finally, the man with the coolest name in the AFL Lewis Melican ($150,000) scored 55 points from 78 per cent game time and should be your captain. Shane Mumford ($513,000) and Steve Johnson ($501,000) got through unscathed in their returns from injury and no new injuries occurred despite the conditions which is really all that matters in early March. To finish off, Isaac Heeney ($442,000) didn’t play and Bret Deledio ($553,000) has been ruled out of round one by the Giants. I do not have words negative enough to describe this “game” of “football”. Without a lot of Fantasy relevance and with only one team having a mild amount of footballing talent, it was extremely difficult to watch and persist, it actually made me physically cringe at times. Anyway, let’s get on to the small amount of Fantasy relevance. We’ll begin with the trash before the treasure and my god are they sorry numbers. Top scorer Sam Kerridge (MID $485,000) has about 100% less Fantasy relevance this season compared to last as he’s lost his Forward DPP and his low price. I can’t see any reason to have him in a classic team but he could be alright later on in draft leagues, really deep draft leagues… He had 85 Fantasy points from 85% TOG but was hardly damaging. Popular defender rookie from last round Caleb Marchbank (DEF $205,000) showed everybody why #StayStrongJLT is a thing, stinking it up for the first half and ending with 59 points from 85% TOG. This is a very clear message to everybody playing AFL Fantasy: DO NOT pick your rookies based on one game of the pre-season tournament, they will let you down every time. I’ve been thinking all week that Caleb is getting way too much hype for what he is and he proved me right this afternoon. Can’t wait to see the crap Curtly Hampton chucks up. Soon-to-be superstar Patrick Cripps (MID $601,000) managed a measley 27 points from the first quarter and part of the second before making his way off for an unearned rest for the rest of the afternoon. I get that his 39% TOG was a result of managing but in a game where Carlton needed at least a shred of class Cripps was definitely missed. David Cuningham (MID $262,000) is a bloke I’ve never heard of and needs some sort of anger management session but his attack on the ball was solid, making his way to 63 points from 70% TOG with 5 tackles but he was unpolished and I can’t see him getting a game personally, if he does Carlton is in strife. The two Curnow’s were probably the only players on the Blues team that actually impressed me. Charlie Curnow (FWD $237,000) played the first half, earning himself 35 points from 48% with ferocious attack on the ball. His skills need sharpening for sure but he was pretty much the sole shining light for Carlton in the first half and I was amazed by his never-say-die attitude in such a horribly one-sided affair. Ed Curnow (MID $614,000) was the opposite, playing the whole game and lighting it up in the second half to finish with 79 points from 75% game time. I feel Curnow is a bit irrelevant because there are players just as good or better at similar or cheaper prices but he does have the ability to go big and would definitely be a PoD. Mid-priced forward Billie Smedts (MID/FWD $259,000) showed he’s not worth half of his price-tag. Some thought the change of club would help Smedts breakout into what Zach Tuohy used to be for Carlton but he couldn’t and I can’t see him keeping a spot when Simpson and Docherty and the like come back into the team. He managed just 46 from 78% TOG. Second-yearer Jacob Weitering (DEF $347,000) was probably the other player who stood out to me but even he looked disgusting at times, grassing open chest marks and missing easy kicks. I can’t see him being Fantasy relevant again for a little while yet but keep an eye on him because he could be the next Brian Lake. Lastly, former GWS reserves player Rhys Palmer (FWD $393,000) showed us that he might be worth considering managing 71 points from 69% TOG despite only kicking the one behind. The problem with Palmer tends to be his inconsistency but he does have Fantasy game. He saves you around $50k from Heeney and is actually a very talented player when he’s healthy and he wants to be talented. I personally think not but hey, some risks pay off! Now, to the actual contenders. I’d like to start this with a disclaimer: St Kilda didn’t have any opposition today so I feel this game can be put down as an anomaly and should probably not be taken into even slight consideration. However, the three Jacks showed once again that St Kilda don’t need an Ace to compete (Jack’s and Ace’s, get it? HA). Jack Steele (MID/FWD $432,000) made his case after recovering from his foot injury and coming back to top score for the game with 120 Fantasy points from just 69% TOG. Wow. The craziest thing about it is he wasn’t overly impressive! I mean, yeah he was around but he didn’t stand out terribly nor did he do anything incredibly special, he was just there. The boy has talent, there is absolutely no denying that, and if he can manage 120 points from 25 disposals every week then he should be a lock. Jack Billings (MID/FWD $479,000) was almost as impressive, picking up 103 points from 76% TOG and a game high 30 disposals. Billings gained a heap of midfield time with the omissions of Rooey and Joey and he thrived as you can tell from his Fantasy stat line. I can’t see him being this good with the two previously mentioned coming back and therefore he’s not worth his price but, if he can keep this up he could be this year’s Seb Ross. The third and final Jack I’ll mention in this article is my favourite; Jack Steven (MID $630,000) was incredible, netting himself 80 points from 62% TOG but it’s his work rate that does my head in. This bloke has a magnet inside of him, attracting the pill wherever he goes and yet he chases, hounds and defends like his life is on the line. If you don’t have him in your team you need to because he’s going to be HUGE. Just get him in and keep him there for all of eternity. My boy Koby Stevens (MID/FWD $517,000) was also pretty solid in the first half but went missing a bit after that, managing 71 points from 71%. I’m a bit worried about the points he’s going to lose when the Saints have a full-strength 22 and I’m slowly turning off picking him but he’s still there as my F2 and, who knows, anything can happen come Round 1 lockout. Aforementioned last-year breakout player Seb Ross (MID $594,000) was okay from a half of footy, earning himself 30 points from 47% TOG but I can’t see him being even draft league relevant this year so I wouldn’t poke that price with a ten foot pole. One that impressed me and David Armitage, who with Sir Sandy Roberts in the third quarter, was Ben Long (DEF/FWD $202,000). I must admit, I’d never heard of him before today but he was good to say the least with 7 tackles earning him 55 points from just 42% TOG. I couldn’t fault the boy on the day but $202,000 is a fair price to pay for a guy who could potentially not get a spot all year. The scoring potential is 100% there, the job security is certainly not. Ex-Hawk Shane Savage (DEF $454,000) wasn’t allowed a free-roaming role off half-back as per usual and was usually found booting the ball for miles out of the back pocket. This ruined his scoring and could be a worry for people looking for a defender late in the draft rounds as Sav will be off the table if he continues playing as a shutdown defender. Jade Gresham (FWD $364,000) seemed to be the beneficiary of a bit of midfield time and played fantastically up forward, reading the contest extremely well for a young player. I’m not sure about his scoring potential, managing 62 from 65%, but the boy can definitely play and I’ll be looking to the scrap-heap of my Ultimate Footy Keeper’s League to see if I can get him at some point. Blake Acres (MID/FWD $431,000) isn’t worth the inflated price-tag this year despite having a bit of talent. 53 points from 70% TOG playing pretty much solely through the middle shows that Acres is still a few years from his best, wait and see. David Armitage (MID $518,000) played 33% of the game before heading off to give his “expert” analysis apparently. He had 32 points but I feel you can’t read into that at all due to his low amount of game time. Bailey Rice (DEF $150,000) was solid in defense which is unfortunately a line we have a plethora of bottom-priced rooks for. He only managed 45 points from his 84% game time but I actually think he would have impressed Coach Hamill (filling in for Richo) maybe even enough to get a game! Jake Carlisle (DEF/FWD $359,000) was pathetic after a year out of the game, stay away. And finally, Billy Longer (RUC $281,000) was alright managing 78 points from 86% TOG against minimal opposition. He does look like he will be a solo ruckman however until Hickey comes back. He’s pretty cheap and could be an option but I wouldn’t. That’s it for this game, I hope none of you had to endure actually watching it. Things look very dim for Carlton this season. The heat rule was enforced in Mandurah as the Dockers and Pies played out an epic finish in 35+ degree heat. Both teams fielded almost full-strength squads, so there was plenty to get out of this match despite the shortened quarters (22 mins with no time on) and the rotations to keep the players ticking along. Stephen Hill (MID, $548,000) was the top scorer for the arvo thanks to his 29 touches, five marks and six tackles. He kicked one goal for his 122 points from 81% TOG). His brother, Bradley Hill (MID/FWD, $417,000), finished with 84 as he looked at home on the wing at his new club. We saw plenty of David Mundy (MID, $538,000) through the midfield and his numbers look set to rise after a down season last year. I don’t think we’ll see DPP added based on today. The big name we are considering as an under-priced midfielder, Nat Fyfe (MID, $595,000) was crashing packs and got plenty of game time into his legs with four marks and three tackles to go with his 19 disposals and 73 (89% TOG). No dramas with him in my current side… wait on JLT4 to make any definitive decision. He’s fit. In the first game of the year for Lachie Neale (MID, $671,000), the midfielder who went at over 111 points last year, played 66% TOG for 40 points. He was very handball happy with 15 of the two pointers in his 18 disposals. Don’t get fooled by Michael Walters (FWD, $493,000) as he once again starred kicking three goals. He roamed up the ground a bit but he doesn’t have the Fantasy game – or ability to rack up enough of the ball – to make him a consistent enough player for consideration. Cam McCarthy (FWD, $211,000) played 92% of the game for a solid 47 points, kicking one goal and two behinds. We’re probably going to have better options as forward rookies that are cheaper for better output. However, job security is as high as anyone under $250K. Sunshine is an important part of their make up. Oh, and Aaron Sandilands (RUC, $450,000) is too expensive in my opinion on Classic, but he is definitely draftable. Look out for him in the mid-teens on your Draft day. The midfield for the Pies consisted of the usual suspects – Scott Pendlebury (MID, $641,000) had 19 touches and 73 points (64% TOG) to say he’ll be right as a potentially unique option this year, Adam Treloar (MID, $673,000) rolled the legs over and competed when needed without setting the world on fire (62, 76%) and Taylor Adams (DEF/MID, $622,000) kicked a cracking goal in the last quarter as he played predominantly midfield. The DPP had 21 touches but only took one mark and laid one tackle for his 62 points (69% TOG). No dramas in picking any of those blokes as their midfield minutes will be right up there when it comes to the season proper. Feeding the midfield the ball was Brodie Grundy (RUC, $609,000). Primarily up against the big man in Sandi, Grundy had 16 hitouts to 211’s 20 but it was his work around the ground that saw him average 110+ in the back half of 2016. He collected 16 disposals, took five marks on his way to 77 (87% TOG). Some have been worried about his numbers being affected by Mason Cox (FWD, $316,000) taking some time away from him. After watching today, Cox will be spending most of his time forward without a doubt and there shouldn’t be too much concern on Grundy’s scores. Cox bagged three snags and had the five hitouts. Jesse White and Darcy Moore also competed in some ruck contests during the game. Levi Greenwood (MID/FWD, $484,000) played as a high half-forward and had some time int he midfield. He scored 63 from 74% TOG. Calvin will be interested, I’m not. Likewise, Jeremy Howe (DEF, $497,000) played a Fantasy friendly role – even snuck forward to kick a ripping supergoal – but it’s hard to trust him. There will be plenty of jobs to come and his scoring, as we saw last year, was sporadic. I was keen to see how Will Hoskin-Elliott (FWD, $230,000) would go today and while I saw some good things – including some handy clearances – he’s not quite a lock for me as yet. I think he’s best 22, but depending on what rookies will be available, I’m not sure I will shell out the extra dollars for him just yet. Really though, his 45 from 68% TOG is a great return and we’ll get $100K or so out of him in the opening rounds. Matthew Scharenberg (DEF, 234,000) had limited time on ground. I didn’t sight him a lot, but he managed 7 disposalson his way to 23 points (35% TOG). Obviously managed for this game, but I’ll need to see JLT4 to get more of a read on the defender returning from knee injuries. 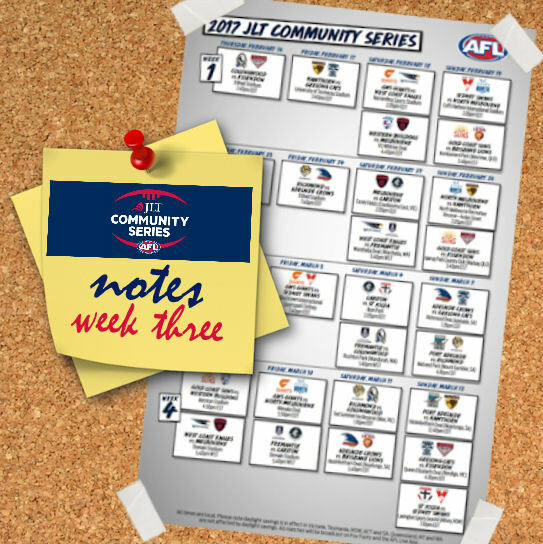 The JLT Community series continued this afternoon with Adelaide playing host to Geelong at Richmond Oval. The Crows appear to be one of the more intriguing teams heading into 2017, given the obvious holes in the midfield making some of their lesser likes appealing for Fantasy benches. The Cats on the other hand, had last week off and fielded the majority of their best 22. Let’s get stuck into some numbers, starting with the home side. Matt Crouch (MID, $564,000) ran the show and was at his prolific best. After starting with 14 points in the opening term, he really asserted his authority on the contest through the middle. He finished the day with 28 disposals, 5 marks, 4 tackles and 94 Fantasy points from 92% TOG. Given the lack of midfield options for the Crows, expect Matt Crouch to find stacks of the ball. He currently sits at M5 in my team. Rory Laird (DEF, $584,000) is one many people have pencilled into their defence after a massive display against Richmond. Although he wasn’t quite as dominant against Geelong, Rory still scored 78 from 79% TOG. He really is one of the best defencive options out there and should be aiming for a three-figure average in 2017. Sam Jacobs (RUC, $534,000) appeared to have back problems against Richmond but the big man seems to be over that. Rotated in and out of the ruck with youngster Reilly O’Brien (RUC, $340,000) and was solid if unspectacular and ended with 48 off 52% game time. I think the removal of the third-man-up rule should see his average return to the mid nineties if he can stay on the park. Not the worst option and one that I am considering. Rory Atkins (MID, $441,000) was one of the best players on the ground. He kicked the first two majors of the game including a supergoal and added another in the third. The Crows are relying on improvement from their youth and Atkins is one who will look to take his game to the next level in 2017. Wayne Milera (FWD, $286,000) started on wing and is already one of my favourite players. At times he looked brilliant with pin-point footwork. Would love to see him get an extended opportunity in the Crows 22 like he did at the beginning of last year. Scored 35 from 76% and doubt he’ll be Fantasy relevant with the likes of McCluggage and Hoskin-Elliott available for less. Nevertheless, was a decent outing for the zippy forward who could see short stints in the midfield. One that is likely to feature in round one is Riley Knight (FWD, $241,000). The speedster offers great energy around the contest. Another who won’t be a massive scorer, although he did manage a decent score of 39 from 49%. Expect him to somewhat replace Charlie Cameron at half-forward with Cameron eyeing a move onto the wing. The Crows also unveiled their first pick of the 2016 draft Jordan Gallucci (MID/FWD, $222,000). Had some good moments but wasn’t prominent in the stats department as you would expect, finishing with just 26 Fantasy points (61% TOG). If he does make his AFL debut, he will more than likely start on the outside even though he is capable of playing inside as well. Gallucci’s mate Myles Poholke (MID/FWD, $164,000) was another youngster looking to press his case for an early debut. Wasn’t prolific with 5 disposals and 22 points from 55% time on ground but is one to watch. Is ready to go in terms of strength and size. Andy Otten (DEF, $150,000) should be on your radar for a bench spot in defence. He played pretty much the entire game, scoring 71 Fantasy points. If injuries to Kyle Cheney and Tom Doedee restrict them from playing early doors, Otten is the man to fill the gap. Only a bench option but a good one at that. Harrison Wigg (MID, $150,000) was excellent against Richmond and was decent this afternoon as well. Collected 11 disposals, 1 tackle and 35 Fantasy points from 58% TOG. I did notice that he was a bit shaky with ball in hand, throwing it onto the boot almost as soon as he gets it. Did take a few kick ins, however, and looks a good midfield bench option. Former Boomers basketballer Hugh Greenwood (MID, $150,000) also made his debut for the club today. He provides X-Factor up forward and in the middle with his size and strength. Not one of the leading candidates to replace the traded Jarryd Lyons but would add something different. If Curtly Hampton (DEF, $204,000) isn’t in your side, he probably should be. Started in centre square and finished with 63 from 84% TOG. Didn’t find much of it early but lifted in the third term, as did the Crows. His precise footwork and electrifying speed will be a serious weapon. Whether he plays up forward, down back or through the midfield, Hampton looks to be a bargain and should be looking for an average of 70+. Will be interesting to see how the above mentioned players go next week against Brisbane as I expect them, along with many other teams, to field their best side possible. For the Cats, skipper Joel Selwood (MID, $619,000), fresh off a speeding fine, perhaps ironically started slowly and didn’t set the world on fire. After just 16 points in the first half, he finished with 63 Fantasy points off 73% game time and accumulated 14 touches. Was obviously not giving it his all and could be a bargain pick up in a draft. Patty Dangerfield (MID, $712,000) returned to Adelaide for the second time since his well-documented departure but only played a half before putting the feet up. Barely left third gear when he was out there and still ended with 11 disposals, 3 marks and 39 points (43% TOG). He is an obvious choice and you could just about put your house on the fact he will average 110+. Just two games into his Geelong career, Zach Tuohy (DEF, $442,000) already looks to be an inspired pick up. The Irishman was exceptional. Very prolific of the back flank and typically precise with ball in hand. Barely missed a target. Currently owned by 3% but expect that to climb by the time round one comes around. He ended with 97 points from 93% TOG. Fellow defender Tom Stewart (DEF, $172,000) was great in the opening half but didn’t have much of an influence after that and scored 57 from 91% time on ground. Still looks to be a leading rookie defender. Zach Guthrie (DEF, $150,000), the brother of Cam, ended the day with what looks to be an ankle injury or perhaps a hyper-extended knee. Fingers crossed he’ll be okay as he looked very good again. He reads the ball and positions himself very well for a young man. Perhaps worth a shot at D7/8 and as judging by his JLT performances, we won’t have seen the last of him in 2017. A popular choice up forward is Aaron Black (FWD, $150,000). He missed a relatively easy mark in the second term which could have led to a goal and didn’t have a huge influence on the game during his 57 minutes on the ground. Ended the day with 35 points and should still be considered for a spot on the field. He was an obvious choice early in the pre-season but Jackson Thurlow (DEF, $282,000) looks to off made his way off the radar for many. With 18 disposals, 3 marks and 3 tackles, Thurlow finished with 61 points (74%). This is the type of performance we should expect to see from the half-backman during the season proper. The Geelong backline is starting to look very promising from a Fantasy perspective. Sam Menegola (MID, $505,000) is one who could be a sleeper in drafts. Really impressed last year and finished the day with 21 disposals, 7 marks, 3 tackles and 82 points from the 80 minutes he spent on Richmond Oval. Would certainly be a POD in classic. In a stunning afternoon over a Mount Gambier, the tiges won a bit of a slog against port in a low scoring affair. DT wise was also a low scoring affair without a single player hitting 100. Lets get straight to business, the story of this match was “The Widow Maker” Toby Nakervis (Ruck $365,000) who scored an impressive 94 79% TOG and was the top scorer for the match. The Tiges are super happy with him, and from after match interviews love his follow up pressure and 5 tackles from a ruckman is great. He is doing everything needed to be selected as the Tiges number 1 ruckman, and will a popular midpriced Ruck 2 pick up, or even a sneaky forward line “back up ruck”. Also for the Tiges, Brandon Ellis (Mid $540,000) scored a solid 91 85% TOG, but he remains nothing more than a bit of a risky POD in my books, having a hugely indifferent year last year and mostly relevant due to a later in season defender status. Anthony Miles (Mid $521,000) is in a similar boat as Ellis as a risky POD, rounds out our top 3 scorers for the game, which honestly isnt saying much at all. Dustin Martin (Mid $646,000) who is oft overlooked it seems since he lost his forward status, showed he can certainly rack up scores quickly if he wants. Ended on 62 but from only 55% TOG, although that -3 total in last quarter always looks bad. Another key player who didnt spend a lot on the field is recent brownlow medalist receiver Trent Cotchin (Mid $585,000) with 58% TOG. He looked great in the first quarter with 36 but finished on 58. Hes on many never again lists for a reason, but is one of those players whom I always think, maybe, just maybe, could live up to his potential. Rookie Daniel Butler (Fwd $150,000) scored a very solid 53 Fantasy points with 88% TOG, slightly inflated by a massive 15 point play in which he kicked the ball to himself 2 times before kicking a goal. Expensive midprice option Josh Caddy (Mid/Fwd $517,000) didn’t seem to have the scoring breakout I would want to select him with 70 88% TOG. I tried very hard to look for a lot of positives for the premium options at port in this game, but there really isnt too much to say. Unfortunately Jasper Pittard (Def $496,000) pinged a hammy in the second quarter. Chad Wingard (Fwd $432,000) also had a pretty nasty corky in the last quarter, but 31 from 61% TOG isnt much to write home about. Ollie Wines (Mid $607,000) scored 71 from 61% TOG which isnt the end of the world I guess. Jared Polec (Mid $451,000) scored 74 from 85% TOG but yeah…whatev, most of that was scored late in game when it was mostly over. Hamish Hartlett (Def/Mid $474,000) piqued my interest before JLT cup, but 67 from 73% TOG and not seeming to have a great influence on the game has made my interest wane. Patrick Ryder (Ruck/fwd $411,000) did a bit better this game, but just a bit with 48 from 63% TOG. However… he was involved in a bit of a late bump incident which will be looked at. Id say a fine at worse, but you never know. The story for Port was the rookies. Could Joe Atley (Mid $188,000) with a really solid 64 from 60% TOG be our saviour in the mids?. Hype expensive rookie Sam Powell-Pepper (Mid $216,000) looked much better this game, and made some great looking plays, including one where he ran through the pack and fed it off to Joe Atley for a goal. He scored 56 from 67% TOG which isnt too bad at all. Brett Eddy (Fwd $150,000) the star from the SANFL, may have only got 36 from 63% TOG, but I cant help but imagine what would happen if he actually kicked those goals (was on 0.6 in total until he finally got a goal in the third quarter). I still think he looks a solid forward option for Port and the mature age rookie should get some playing time. And yet again Dan Houston (Fwd $150,000) scored an ok 46 from 79% TOG, not awe inspiring but showing he could be a slow burn cashcow on your bench if named. Aidyn Johnson (Fwd $150,000) 24 66% TOG and Willem Drew (Fwd/Mid $186,000) 22 30% TOG didnt do enough to allow a proper discussion. Wow Zorko is just so tempting but it would take some serious balls to start with him. My concern with Barret is first he has to get upgraded,then he has to get a game. Even if he does that, I think he spends a lot of time forward and I’m not sure the ball will be down there that much during the season proper. The only issue I have with the current trend of assessments is in the logic we should a)not read anything in to poor form but b) at the same time value excellent form. Surely both must be taken with a pinch of salt. Just a thought, not a criticism. I always enjoy Calvins articles. He looks at things different and that gets my respect! Bewick played a fantasy friendly role tonight. Shame he isn’t a tad cheaper. I watch JLT to see if the kids go ok and ex-injured players get through ok. Barrett was ok and for his price if elevated is tempting, i would nto expect 70+ per gaem though, but he is in my lsit of possible rookies with the other 15 or so i have. Beams looked smooth and i was pelased with this, if he plays one more and gets through he is in for me at that price. Obviously Rocky just doing his normal pre season jog around the field its not liek hes trying to get into the team or anything – dont read anything into that. Martin has lost his speed. He doesn’t get to as many contests as he used to. GWS’ depth is that terrifying I also wouldn’t be surprised if he didn’t play a game in the first half of the season. No talk about dylan Sheil?? just trying to understand the top hat for walters,but then I thought, a top hat turned upside down would hold the same amount of vomit as a bucket. Agreed, dont get fooled. So 140 from 2 games from a 205,000$ player proves Sparksy right ? Id take an 85 followed by a 55, average of 70 from a player that price any day. And his BE is only 35. You’re spending over $50k more than a bottom priced defender for the same score and there are so many bottom pricers on offer. Plus there was no Kade or Docherty and they both like to play off their man so that will mean less looseness back there for Marchbank. I just think he’s been overhyped for what he is and won’t average much better than a EVW/Hibberd type player. Yeah, that’s the awesome thing about opinions… we’re entitled to voice our own then pick our teams based on them. Otherwise every mofo’s team would be the same. What’d be the point of that!? Comparing Marchbank breaking into the Carlton team is nothing like Curtly forcing his way into Adelaide. Your mistake is thinking Marchbank would be good in the worst team in the league and comparing that to a player breaking his way into one of the best teams in the league. Hampton’s not in yet, true, but he’s 90% there. I would’ve thought $517000 fwd was a premium price? 70 from 88% TOG isn’t that bad considering that it wasn’t a high scoring fantasy game. Hence expensive “mid price” lol Ive had this debate with a few on forums haha. I just cant make myself say he is premium…says a lot of what I think of him as an option. What’s wrong with him as a fwd option? He’d be better option than Isaac Heeney and Smith IMO. The only one I would say maybe a better option is Touk Miller but I’m still to be convinced. I’d argue that the difference between Touk and Caddy is Touk has the runs on the board. He averaged 105 in his last 7 games of the year when they threw him in the midfield. Gaz and a few others, like Swallow, will be back in there so his potential could drop. Caddy is solid. He will have more opportunity at Tiges and they look like they will give him mid time. But hes unproven as a main mid, and I personally dont think there is a strong enough guarantee he will be scoring tonnes week in and week out, and at his price thats what I would want. Dont forget he is also coming off a really nasty knee injury as well. But you hit the nail on the head, our forward premium options seem well, super weak this year. To me thats even more reason to keep a few slots free. I have no doubts when DPP position changes come out in 6 weeks there will be some nice inclusions since fwd options seem so week. Theres my analysis. Take it as you will :P.
Caddy is still a good option. He simply hasnt done enough just for me to be chosen. Like the above comment, he is priced as a premium, but I think of him as a risky midpricer…but…there isnt that many options in our forward line. I may even be inclined to take a punt on a midpricer and hope some amazing options come up round 6 for the DPP changes. If he was that good he wouldn’t be playing at Richmond… his THIRD club. Not a premo, barely even a premo’s a-hole. If he’s your #1 forward or even in there at all, it’s time to delete team! He’s unproven still. Don’t know why people are jumping on him. It’s either going to be Caddy or Touk for that F3 position. I’ve had a Richmond Player as my F1 for the last 3 years prior to this. @anth80… I don’t know if Heeney is better or not. I don’t have him or Caddy because they’re dreadful choices. I’m stacking my mids and taking every cheap option I can up forward. Macrae and Dahlhaus, then daylight to Nankervis. His DPP has saved me from a fate worse than a choice between Caddy and Heeney! Yeah Its not too bad. I personally wouldn’t think it enough for me to warrant selecting him at this stage. There are other pundits who think Caddy could go bang since he is getting a midfield role at the tiges. Just calling it as a I see it. I could easily be wrong. he’s not premium but he’s not mid priced either. So many definitions for this. Many argue that arbitrarily $500K+ is premium. Id say that its “premium priced”. Id absolutely 100% choose Luke Dahlhaus over Caddy. If not Caddy who would you recommend? Don’t see Heeney getting mid time when season proper starts, same with Touk and don’t like Smith. Already have Macrae and Dahl. +1 or, I may take a punt on a genuine “midpricer”. Even The Nank is an option! I am toying with Roughie as well. P.s. I had a mancrush on Toukie last year. I called he would have a break out and had him in my elite. Was woeful at the start but finally got it together end of season. I might be a tad biased lol. At least steele is a genuine midpricer but he comes with genuine risk. Franklin is a KPP and very inconsistent, Roo is expensive for my structure. I guess it’s Koby Stevens but he’s done nothing to impress. The only decent option apart from Touk is Caddy. Or Jack Billings but will he get the mid time also? Any reason why George Horlin Smith wasn’t mentioned? Had an amazing game and rookie priced. +1 watched the game and he was everywhere, came straight in to my team and is going to stay there. Laird and Fyfe or Toughy and Dangerfield? No mention of Troy Menzel? With hibberd (Melb) Achilles sore. Should we be looking elsewhere? I am organizing an AF league with one person representing each AFL club. Only two spots to be filled…Melbourne and Richmond. If you are interested in representing the Cats then quote this post for an invite code. It’s free to join, and prizes are awarded to the minor premier and overall winner. Get on board for some fun and banter.